How do I do an availability check? The “Availability Check” button is on the top right of the rental reservations page, highlighted below in orange. You can check to see if there is an available vehicle for rent with these steps. Click on the blue “Availability Check” button on the top right of the page, highlighted in orange in the picture above. Pick the date and time of the pickup and return date of the rental period. 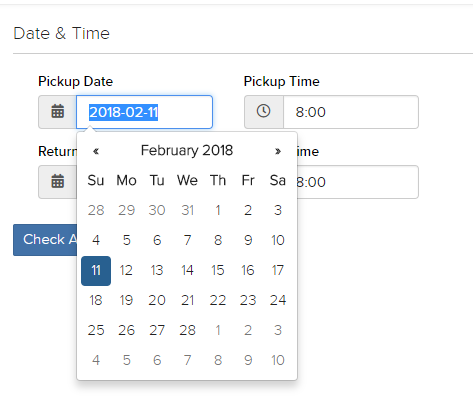 The calendar picker helps the customer to select the dates easier. The time can be selected from a dropdown list as shown in the picture below. The time between the intervals is 15 minutes. 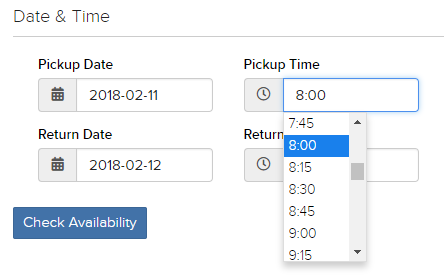 After you have selected the time period, click on the blue “Check Availability” button to continue. Once you have done so, it will redirect you to a list showing all the available vehicle classes. You can also see the details of each vehicle class that you have keyed into the system. By clicking on the green “Continue” button of any of the vehicle class, it will automatically create a new reservation with the selected vehicle class and period of time and head into step 3 of the reservation process. To learn how to create a new reservation from step 1, click here.